Many customers have requested a filament polyester bobbin thread, so we're now offering this white 100% filament polyester bobbin thread in a mini-king spool. 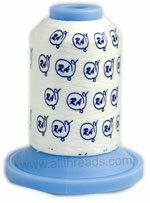 Each spool contains 1100 yards of two-ply bobbin-weight filament polyester thread and will fill about 10 or 11 bobbins. This Robison-Anton spun polyester thread is designed for those who prefer to wind their own bobbins, instead of using pre-wound bobbins. Each spool contains 10,000 yards of 80-weight, 2-ply bobbin thread. The average bobbin holds about 100 yards of thread. So you can fill roughly 100 bobbins from this one spool! So what's the difference between "Filament" and "Spun" Polyester Bobbin Thread? In practical use, there's no real difference between the two. The only real obvious difference is that Spun Polyester bobbin thread has a somewhat "fuzzy" look to it and will produce more lint. 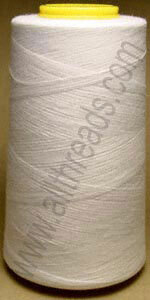 Filament polyester bobbin thread is smooth, with almost no lint at all. You can safely choose either type of bobbin thread for use with your embroidery machine.